I got the candidate to clean an AGA cooker with me. We then did a recap of all the stuff that we had done in the week and also went through the manual again to ensure that any questions that needed to be answered from a read through of the manual could be answered. We finished at lunch time as the candidate had a long drive back. This the next in my training course details which was a couple of weeks ago now. 1. Candidate Practical: A full clean of a stainless steel standard single oven, stainless steel hob, and stainless steel extractor unit with stainless steel. I demonstrated how to clean a stainless steel extractor unit with paper filter. Then Candidate finished it off. 2. Candidate Practical. We went to the next house which was also owned by the customer of the first oven we cleaned today. The oven was exactly the same type and model. This oven was particularly dirty, the candidate did most of the cleaning. Lunch – we went to a local shopping centre and bought some sandwiches for lunch. 3. Candidate Practical. The next job consisted of a Miele single oven, hob, and extractor unit and a microwave unit. I let the candidate do most of this job himself. I checked the work at the end and we had to remove the self cleaning sides and clean them manually to get a better end result. Overall we achieved a lot today. We recapped the cleaning process of stainless steel, we went through the process of cleaning ovens with ribbed sides and we were able to test this out on a particularly dirty oven. The variation in the levels of the jobs, the dirtiness of the ovens showed the different levels of perceived dirtiness by different customers. I also showed the candidate that even at a slow pace of work – we had exceeded the timings I normally allow myself and my employees that a good turnover is possible. Turnover for the day was: £267 (if you think it should have been another £20 as you have seen our oven cleaning prices the reason it wasn't was because we did the extractor on the first job for free as I wanted the candidate to have experience of cleaning that sort of extractor). This was last week but I have now found time to write what we did in the day. standard extractor unit with wooden front to match the kitchen units. Show how to cut extractor filter paper to size, put the new paper in extractor properly and get the extractor clean by using right cleaning products. Then the candidate did this himself. 2. Demonstrated how to clean the stainless steel hob. Candidate then did this himself. 3.Hinges on this oven were the fixed type,and the inside was sprayed "self cleaning" sides and tops on both the grill and oven. I demonstrated how to remove the fan cover, how to clean this, how to clean the oven fan, how to remove the light covers, replace bulbs and the right way to clean the self cleaning sides. Candidate took parts out to van and put into the solution the right parts and later removed them using our the correct methods. Lunch back at the office. 4. The afternoon job was cancelled but I booked in another range this time a Range master 90 and overhead extractor hood. Candidate did most of this job himself. I covered some of the things to look out for when cleaning these ranges and the Candidate cleaned the self cleaning sides correctly. Also I covered timings of a job of this size. 5. Cleaning of range master hood. I pointed out the things that had to be looked out for when cleaning this type of extractor hood. Candidate cleaned whole hood himself. This was last week now but I thought I update the other days on my blog so you can get an idea of what we covered. Candidate Practical. A full clean of a student let oven, hob and extractor. I demonstrated the best way to clean thick grease off of a stainless steel extractor hood. Our method of cleaning gauze extractor filters, cleaning of a stainless steel hob, and cleaning of a stainless steel oven. 2.Hinges on this oven were the locking type. We did some practise of getting it off and back on and taking the door apart. I have found that one of the most difficult things to master when cleaning an oven is taking the door off and then taking the door apart to clean the inside of it. 3. Introduction to the different types of AGA cookers including the 3 oven AGA, the 4 oven AGA, the 6-4 range cooker and the 4-2 AGA module. Introduction to the AGA fridge range and quick overview of how to clean it as the outside isn't enamel so has to be cleaned accordingly! The afternoon was going to be a full 2 oven AGA clean but when we got there it wasn't an AGA at all but a large Belling 'Farmhouse' range cooker. 4. Practical – cleaning of Belling range cooker. It was good as because it was a Belling I was able to go through how to remove the fan cover, the fan itself and the self cleaning sides. I'm sure that the Creda is made by the same group that make Belling. The self cleaning sides were exactly like those in the standard Creda double ovens. The arrange was like a Creda double oven on the left hand side and then on the right hand side there was a single oven with different removal self cleaning sides – they just hung on brackets. The hob was particulary dirty and took a whole lot of scraping to remove the burnt on Carbon. So in the end a good training task. 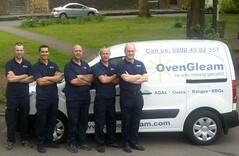 An Oven clean from OvenGleam is sizzling hot. Yes it is true a clean from us, Oven Gleam, is really sizzling hot. So if you want to get your oven, range, or AGA cooker cleaned today why don't you give us a ring? 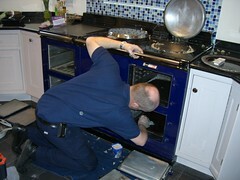 If you are thinking about an oven cleaning franchise why don't you give us a ring about that too 01275 370570. Save your cash and get oven cleaning training without the huge start up fees that a franchise company will ask you for. Today I have been training someone who is just about to start his own oven cleaning business. Today was the first day of five days of training. 1. Course Introduction. Read through the oven cleaning manual and health and safety manual. 2. Health and Safety. A quick to ensure that the candidate was aware of the risks involved in oven cleaning and a walk through the safety features that we have introduced. 3. Set up of Oven Cleaning Kit. A quick look at the contents of an oven cleaners cleaning kit and what it consists of. 4. Introduction to the Oven Cleaning Dip Tank and Rinse System. 5. Introduction to the AGA cooker with an summary of how it works, how to use it and a quick overview of how to clean it. 6. Demonstration of cleaning a single oven, and demonstration of oven cleaning dip tank and rinse system. 7. Candidate practical: complete cleaning a single oven with extractor and hob – supervised by me. Oven Cleaning Van Employees Use for Private Use. If you have oven cleaning employees like us, or other employees who have their vans at home or operate from home, or / and they are using their vans for private use then here is a nudge to make sure that if they do use them it might just cause a few problems for both them and your business. You really need to stop them doing it as there are implications of this sort of use. leaving themselves open for a heavy tax demand and bill. How do I know if the employee has private usage? weekend use, to name but a few. How much will the tax bill be? National Insurance contributions on these amounts as well. whole year for any other reason. records of mileage to show where the van has been used. Employers NI contributions. This letter should be renewed each year. consider having a vehicle policy devised. I'd agree with all this give HR Smart a ring if you need help. We didn't have our regular oven cleaners meeting yesterday, as the guys were all over the place and Nigel had to finish earlier as he is moving house today and we found Alan another job, a range cooker, near Williton, which is near Minehead where he had had two jobs in the morning; so a full day in Minehead for him – it was a bit too far for him to drive back to the office. Our weekly oven cleaners meeting is normally every week and normally it is on a Thursday at a set time. All the guys turn up and we have a proper meeting. I have got a set agenda which I go through. We have been doing this for a few years now and we started doing it on the advice on the Action Coach we had at the time. It is to do with getting together and talking through any problems etc, going through new cleaning ideas, keeping the guys uptodate. It fits in with Brad Sugars' Team Building concepts. For a tip to improve your business if you have a business where you don't see much of your employees it certainly has helped our business to soar. We have also started giving out the employee of the week award and the van of the week award. This has got quite competitive. John who has our brand new Citroen Berlingo has started polishing his oven dip tank; and I do mean polishing it! It looks very shiny. However, as he has the new van we are looking at the other vans and watching to see how they improve on them as he is in a position where he would just win every week. As there is a prize to be awarded for Oven Cleaner of the Year and Oven Cleaner Van of the Year at the end of the year before Christmas the stakes are getting high. So last week John didn't win the van of the week award, we gave it to one of the others who had made a huge improvement on the tidiness and cleanliness of their van. John wasn't too happy that we weren't giving the awards out this week as we didn't have a proper meeting as he had spent some time getting his van really clean, again. Oh well maybe next week John! If you are looking for Ovengleam ltd then you are nearly in the right place. Our trading name has been Oven Gleam or presented as one word OvenGleam since we started in early 2004. At the time Oven Gleam Ltd name was taken so the name that we registered was The Oven Gleam Team Ltd. So we have a client base of 10,000 + (at the last count) and all these people know us as 'OvenGleam'. All our vans are sign written with OvenGleam and all our marketing uses OvenGleam. We have the domain ovengleam.com and ovengleam.co.uk registered. As we tend to advertise in lots of areas with our main advertising medium being Yellow Pages and BT Phone book, and of course the internet we have large amount of people seeing our advertising as OvenGleam oven cleaning. We are known as 'Oven Gleam' and provide oven cleaning services and AGA cleaning in Bristol, Bath, Exeter, all of Devon, Cardiff, Chippenham, Gloucester, Cheltenham, The Cotswolds, Newport, Frome, Trowbridge, Shatesbury, Hereford, Monmouth, Newbury, Marlborough, Stroud, Cirencester, Swindon, Wiltshire, Taunton, Burnham on Sea, Bridgwater, Minehead, Porlock, Tiverton, Tetbury, Torquay, Paignton, Yeovil, Sherbourne, Salisbury and all surrounding areas. Please give us a ring on 0800 45 82 357 or 01275 370571 to book in your oven, range or AGA cooker cleaning.